Fed likely to raise rates; median forecast may move to four hikes in 2018. With a rate hike all but priced in at the conclusion of the Federal Reserve’s (Fed) policy meeting Wednesday, markets will be focused on changes in the policy statement, a new set of economic and policy forecasts, and Chair Jay Powell’s post-meeting press conference. The median, or middle, dot in the “dot plot” chart of individual rate forecasts may move from three to four, but the context for any change will be more important. While our base case remains that the Fed will maintain its current course and hike rates a total of three times in 2018, risks are increasingly to the upside and markets will be sensitive to any signs that the Fed may be considering a more aggressive, if still gradual, path of rate hikes. We continue to closely monitor the Fed’s assessment of inflation in particular, but for now it looks like inflation threats remain well contained despite accelerating growth. Italy commits to euro. Despite the harsh words being exchanged between Canadian leader Justin Trudeau and President Trump (and other trade officials), U.S equities are poised to open only marginally lower while European stocks are rallying after Italy’s finance minister reiterated the country’s commitment to the currency union. Europe’s debt challenges may not be over but this is clear positive step for global markets. Is it value’s time to shine? The growth style’s historical run of outperformance has continued this year, despite the emergence of several drivers that have traditionally served as catalysts for value stock outperformance, including accelerating economic and profit growth. Year to date, the Russell 1000 Growth Index has returned 9.5%, compared with just 0.5% for the Russell 1000 Value index. Over the past 10 years, including the 2008-09 financial crisis, large cap growth stocks have outperformed value by about 80 percentage points cumulatively in what has been the longest ever growth rally. So as summer approaches, we ask: When will value finally have its day in the sun? Expansion turns 9. The economic expansion officially turns 9 years old this month, making it the second longest behind the 10-year expansion during the 1990s. Today on the LPL Research blog we will take a closer look at this expansion and explain why we think there is a good chance it will become the longest expansion on record when all is said and done. No shortage of catalysts this week. Following the contentious G7 Summit in Quebec over the weekend, the U.S.-North Korea Summit kicks off a very busy week of economic and political events. Monetary policy meetings are being held by the Fed (expectations for a rate hike on Wednesday are near 100%), the European Central Bank, and the Bank of Japan, along with a host of top-tier economic data including Tuesday’s consumer inflation data and retail sales on Thursday. 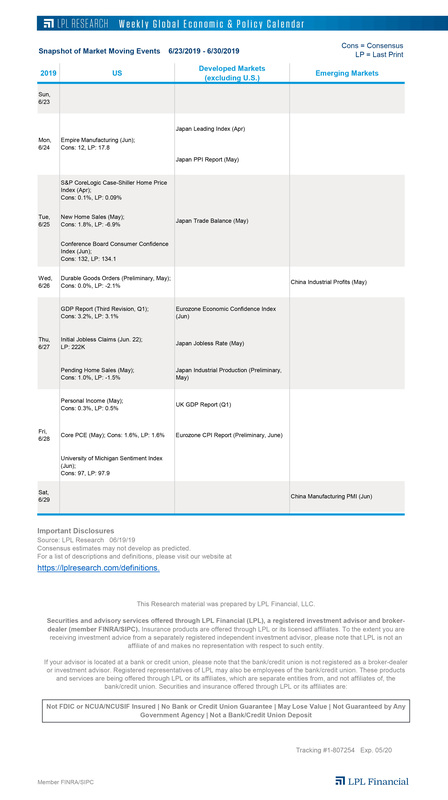 Keep track of the this week’s events with our Weekly Economic Calendar. *Please see Outlook 2018: Return of the Business Cycle publication for additional description and disclosure. The Russell 1000 Growth Index measures the performance of those Russell 21000 companies with higher price-book ratios and higher forecasted growth values. Russell 1000 value Index measures the performance of those Russell 1000 companies with lower price-to-book ratios and lower forecasted growth values. Value investments can perform differently from the market as a whole. They can remain undervalued by the market for long periods of time.